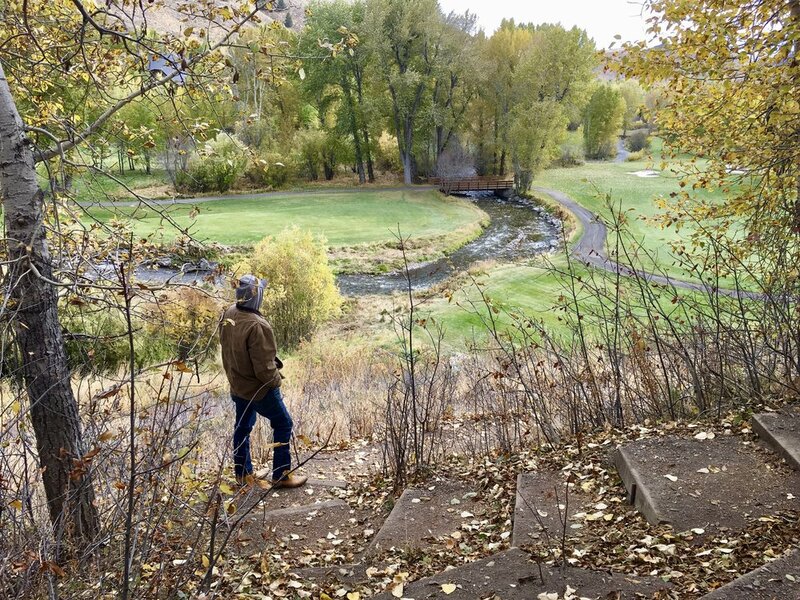 Fall in Idaho is one of the most magical times of year. The days are filled with vibrant color, the mornings are misty and crisp and the mountains are dusted with their first blanket of snow. 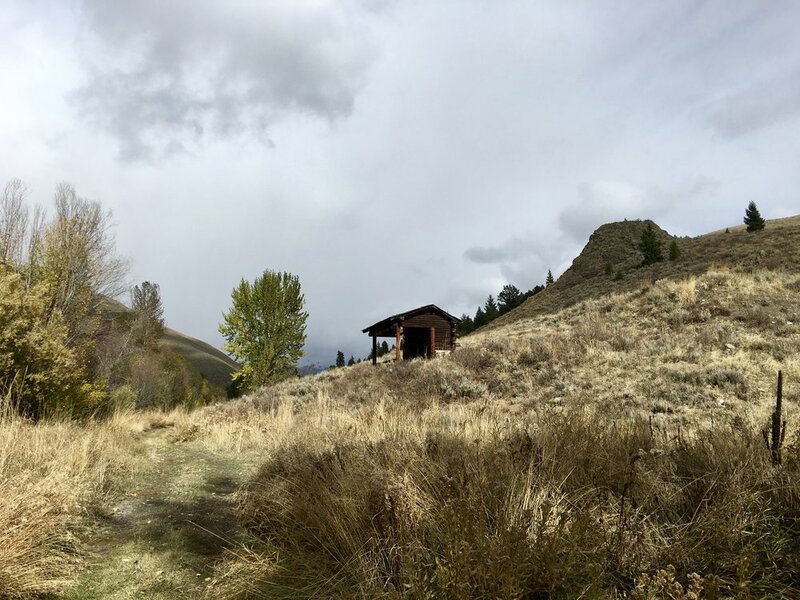 Many have fallen in love with Idaho’s beauty, but no one captured it on paper better than Earnest Hemingway. I’ve always taken an odd pride in knowing that Earnest Hemingway visited my home state, fell in love and decided to stay here until his last days. Maybe it’s because I have always believed that the Idaho mountains hold a kind magic that can’t be found anywhere else and knowing that someone like Hemingway not only felt that draw too, but dedicated some of his most lovely writing to it, made me feel like I might not be completely nuts. 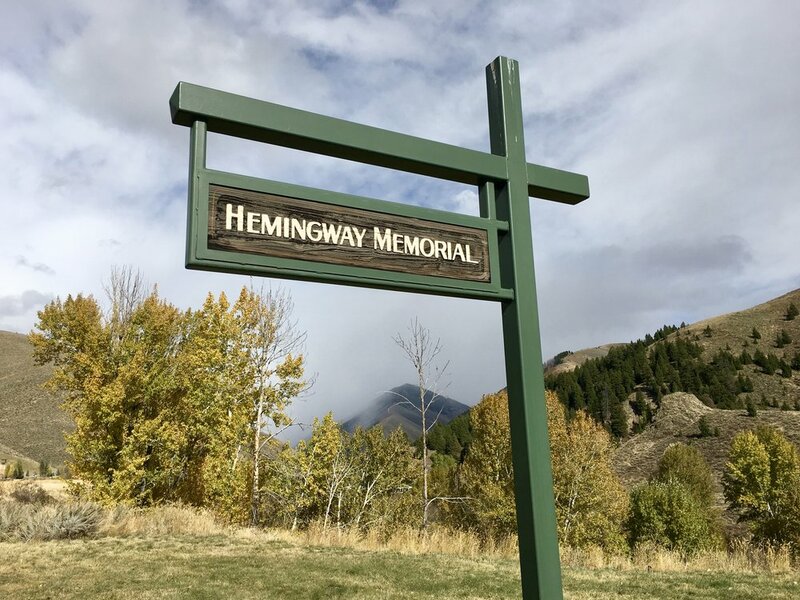 Despite my frequent visits to the Wood River Valley throughout my ENIRE life, somehow I had never visited the Hemingway Memorial. So when Tylor and I found ourselves in the mountains in the heart of autumn, it seemed like the most fitting time for a first visit. 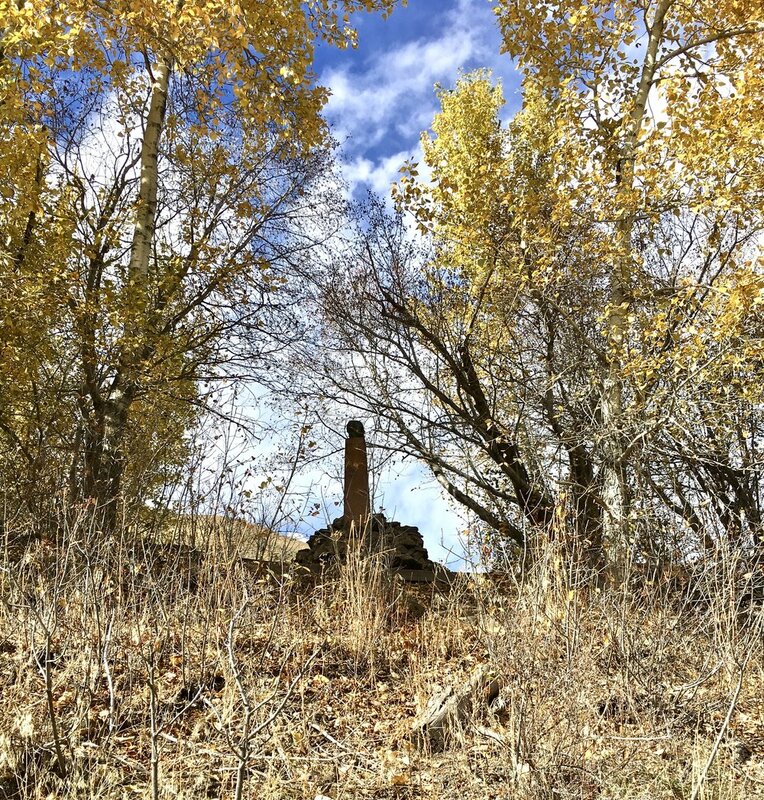 Not knowing what to expect, we ventured out heading North on Sun Valley Road from Ketchum. We were pleasantly surprised to find that in a few short minutes the sign appeared on our right. We parked and walked down the short trail and there it was - A modest statue of Hemingway’s face, perfectly situated in a grove of trees with a bubbling stream running alongside and a mini amphitheater-like sitting area, ideal for reading. Words that many have speculated were truly written as a eulogy for himself. We took some peaceful time to pay tribute and then ventured out on the Proctor Mt Loop Trail - which starts just behind the memorial. Along the trail we came upon a wooden shelter covered in carved signatures from years of visitors. We joined the roster and left our mark, adding our name to a list that felt like it was certainly filled with kindred spirits. Something about the simplicity of the Hemingway memorial felt exactly as I it should be. Although the surrounding area has changed and developed, the view beyond the memorial is still beautiful. It’s easy to imagine the beauty of that spot when it was untouched and how it could inspire thousands of words dedicated to it’s beauty. We will definitely be making this spot a regular stop when we visit the area. The Proctor Loop Trail spans 3.5 miles - we only took in a short part of it this time around, so we will be back to complete the loop when the weather warms up! However the memorial is an easily accessible, beautiful place to visit any time of year. 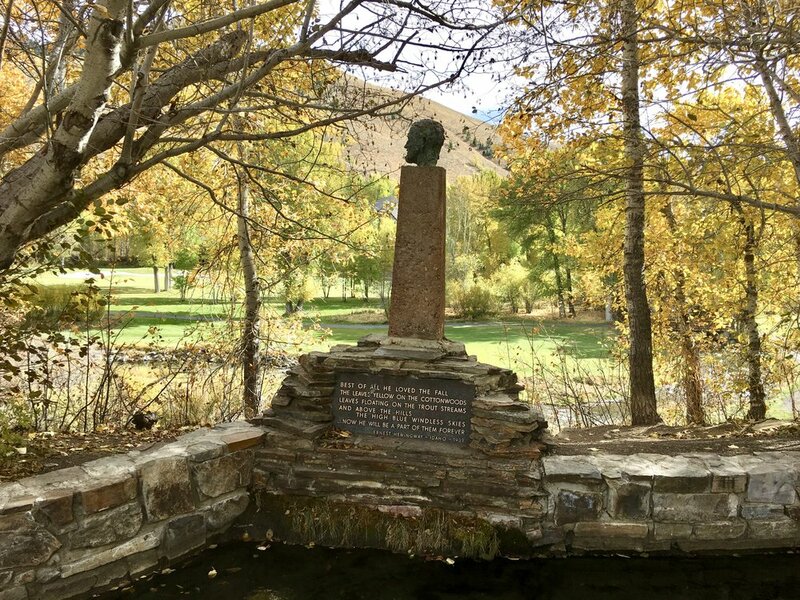 If you are in the Sun Valley area, go check out the Hemingway Memorial. Click HERE for directions. If you're new to AirBnB and book through this link you will receive a $40 travel credit! Feeling Hemingway inspired? I am... always. My business partner wrote another love letter to Hemingway HERE, and she even shares some items to help you create your own Hemingway inspired life (only the good parts of course).